Māgha Pūjā, Makha Bucha, or the Full Moon of Tabodwe (Burmese: တပို့တွဲလပြည့်နေ့ ; Khmer: មាឃបូជា, Meak Bochea; Lao: ມະຄະບູຊາ; Thai: มาฆบูชา) is an important Buddhist festival celebrated on the full moon day of Māgha in Cambodia, Laos, and Thailand, and on the full moon day of Tabodwe in Myanmar. The spiritual aims of the day are: not to commit any kind of sins; do only good; purify one's mind. Māgha Pūjā is a public holiday in Cambodia, Laos, Myanmar, and Thailand and is an occasion when Buddhists tend to go to the temple to perform merit-making activities. It was ten full months after Buddha got enlightenment, on the full-moon day of 6th lunar month, 45 years before the Buddhist era. Magha Puja Day in Wat Khung Taphao, Uttaradit Province, Thailand. The third lunar month is known in the Thai language as Makha (Pali: Māgha); Bucha is also a Thai word (Pali: Pūjā), meaning "to venerate" or "to honor". As such, Makha Bucha Day is for the veneration of Buddha and his teachings on the full moon day of the third lunar month. All were ordained by the Buddha himself: Ehibhikkhus. It was the full-moon day. On this occasion the Buddha gave those Arahants the principles of Buddhism, called "The ovadapatimokha". Those principles are: To cease from all evil; To do what is good; To cleanse one's mind. In Thailand, this teaching has been dubbed the "heart of Buddhism". In Burma, Magha Puja, called the 'Full Moon of Tabaung or Tabodwe Full Moon Day (တပို့တွဲလပြည့်နေ့), is a traditional merit-making day for Buddhists. Tabottwal is the month before last month of the year in the traditional Burmese calendar. The country's largest pagoda festival, the Shwedagon Pagoda Festival, begins during the new moon of the month of Tabodwe in the traditional Burmese calendar and continues until the full moon. The festival begins with a nakyake shitsu ceremony for offerings to the 28 Buddhas (from Taṇhaṅkara to Gotama), followed by a 10-day, nonstop recital of the Patthana, Buddhist scriptures on the 24 causes of worldly phenomena. Other pagoda festivals are held on this day, including the Shwe Settaw Pagoda Festival in Magwe Region's Minbu Township and the Alaungdaw Kathapa Pagoda Festival, near the Alaungdaw Kathapa National Park in Sagaing Region. A youth program held in Thailand. The youth are joining in with a Magha Puja celebration. The Full Moon of Tabaung also coincides with the Pa-O National Day, traditionally set on the day of King Suriyachanda's birth. 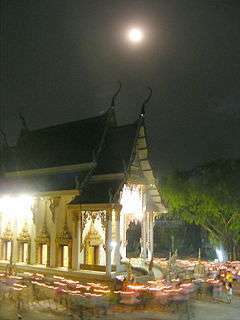 On the evening of Magha full-moon day, each temple in Thailand holds a candlelight procession called a wian thian (wian meaning to circle around; thian meaning candle). Holding flowers, incense and a lighted candle, the monks and congregation members circumambulate clockwise three times around the phra ubosot (ordination hall), once for each of the Three Jewels: the Buddha, the Dharma, and the Sangha. tham bun: Making merit by going to temples for special observances and join in the other Buddhist activities. rap sin': Keeping the Five Precepts. Practice of renunciation: Observe the Eight Precepts, practice of meditation and mental discipline, stay in the temple, wearing white robes, for a number of days. ↑ "Holidays in Thailand in 2016". OfficeHolidays. Retrieved 4 Mar 2015. ↑ "Meritorious deeds performed at religious edifices throughout nation on Full Moon Day of Tabodwe". New Light of Myanmar. 19 Mar 2011. Archived from the original on November 13, 2011. Retrieved 8 Mar 2012. ↑ "Banned festival resumed at Shwedagon Pagoda". Mizzima News. 22 Feb 2012. Retrieved 23 Feb 2012. ↑ Thein, Cherry (10 Mar 2008). "Shwedagon Tabaung festival". Myanmar Times. Retrieved 8 Mar 2012. ↑ Moh Moh Thaw (28 Mar 2011). "Pilgrims flock to Shwesettaw for Tabaung". Myanmar Times. Retrieved 8 Mar 2012. ↑ Thein, Cherry (2 Jan 2012). "Trustees ready remote Alaungdaw Kathapa for festival season". Myanmar Times. Retrieved 8 Mar 2012. ↑ Nandar Chann (May 2004). "Pa-O: The Forgotten People". The Irrawaddy. Retrieved 8 Mar 2012. 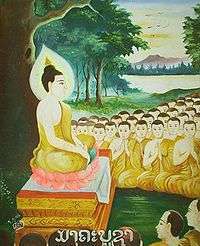 Wikimedia Commons has media related to Magha Puja.